Information is sent home in a variety of ways, in a student's diary, a parental mail-out, via a student's class or pastoral teacher, or from the office, or through the new Parent Paperwork program. Please notify the Business Office if you are a Dominic parent/carer who has for some reason missed an important mail-out, and especially if your contact details (address, mobile, email) have changed. Year level specific notices are often published via the Dominic College App. Download the App to your device to view these notices. Attached is the initial note and teams for the 2019 Term 2 JSSATIS netball roster for 3/4 and 5/6 girls who have signed up. The roster will be out early in Term 2. We are seeking coaches for teams still so please email me if you can assist. The NSJSA Ground Directory is attached. Attached is the initial note for the NSJSA Saturday Soccer for K-6 players. Also attached to this note is the teams for the season. We are desperately seeking more coaches so if you can help out please contact me. There will be a training for all players on Monday 1 April at Dominic run by Mr. Golding and his team of helpers. Please find attached the Flippa Ball Note 2- 2019. Please find attached the rosters for JSSATIS midweek soccer which starts this week. Please make sure you are looking at the correct roster. Attached are the notes for Dominic midweek soccer for JSSATIS. The rosters will be attached on Monday next week. I hope this email finds you well. I am writing to inform you that there was a scheduled fire drill this morning. If your son/daughter mentions there was a fire evacuation at school there is no cause for concern. Fire Drills are part of our regular safety monitoring processes and provide us with valuable feedback to assist us in reviewing these safety processes at our College. The safety of your child is our utmost priority. If you have any questions then please don’t hesitate to contact me by replying to this email or contacting me on 6274 6048. Roster attached for this afternoons AFL Gala Afternoon for 5/6 Girls. Attached is the NSJSA Soccer Roster for rounds 1 and 2. 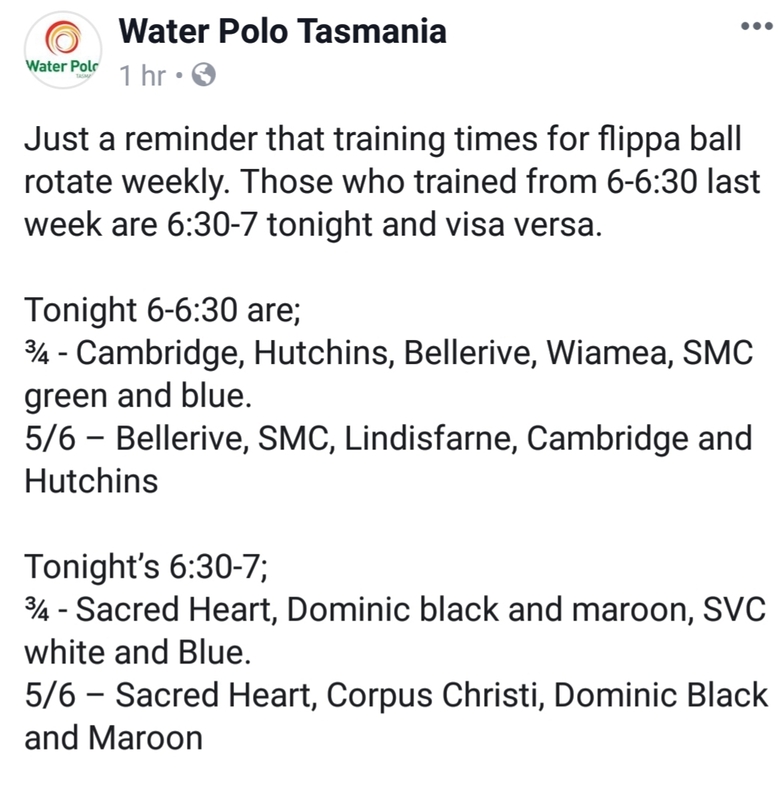 Please see the attached information regarding updated training and match times as published on the Water Polo Tasmania Facebook page. 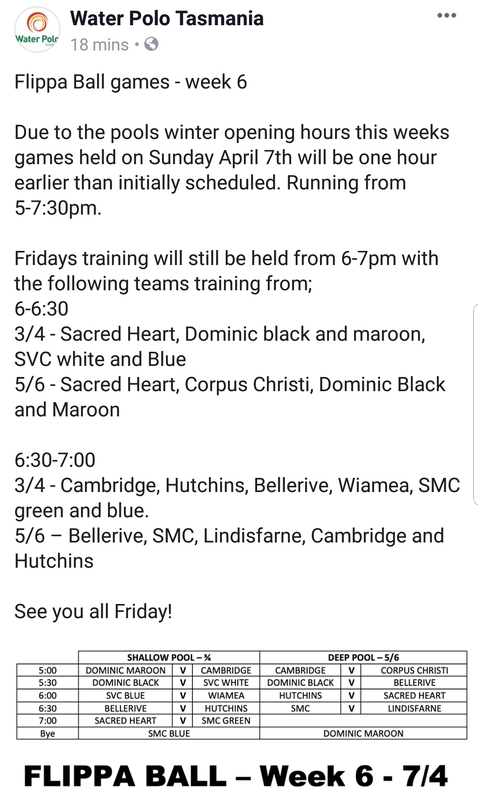 Please find attached the note, program and team for the STCPSSA (Catholic) swimming carnival on Friday 5 April. The team is slightly different due to the events being different at the STCPSSA carnival compared to the JSSATIS carnival. If there are any queries or issues please don't hesitate to email me. School photo envelopes are due back by this Thursday 28 March. No envelopes will be accepted after this date, parents/guardians will need to contact the photographer Pied Piper Portraits directly for late orders. Please note that due to resurfacing of our AFL field, all of Dominic's home games will now be played at Montrose Bay HIgh School. the SATIS website and roster will be updated soon. A Redline bus will transport players to the matches each week. Students will need to be collected by parents from the venue at the conclusion of the game. Please email nmillikan@dominic.tas.edu.au if you have any queries. The Uniform Shop is closed today Monday 25 March due to staff illness. I apologise for any inconvenience this may cause. Thank you for your support of the Cancer Council and Dominic College’s 2019 Relay for Life Team. This is an amazing community event for a sensational cause. We are very proud that we have exceeded our $20,000 fund raising goal for this important cause. Please continue to donate and support the team and the Cancer Council. If you have any associates that are interested in contributing to our team total please pass on the Dominic College details and/or my details. Supervision of students during this event will be paramount and we are very grateful to the large number of staff that are giving up their weekend to support this event to spend time with our students. Parents will be required to sign students IN and OUT at the Dominic Tent and students will be asked to list their PERSONAL Mobile Number when signing in, so they can be contacted at all times. Students are asked to bring their College Blazer, so they can wear this over their Free Dress/Relay for Life Top at all the major ceremonies. Students will be required to bring anything they believe they will need during their stay. This includes: Warm Clothes, Raincoat, Sleeping Bag/Pillow (if staying overnight) and Solid Walking/Running Shoes. Please update any medical information with the College and ensure all medications are given to staff at the event. Medications should be placed in a clip lock bag clearly marked with the student's full name. Include instructions about the amount and frequency of dosages so staff can manage these with students throughout the event. Food is not provided, so students can either bring their own food or purchase from the variety of food options at the event. We will organise a dinner Pizza Order for students who are staying overnight. The Dominic Tent will be located near the 100m start at the Domain Athletics Centre – next to the food stalls, left of the entrance. If you need to contact me during the event please use the contact details listed below. Please note the key event, the Luminary Ceremony, will be held at 8.30pm and is an emotional and touching celebration dedicated to those affected by Cancer. 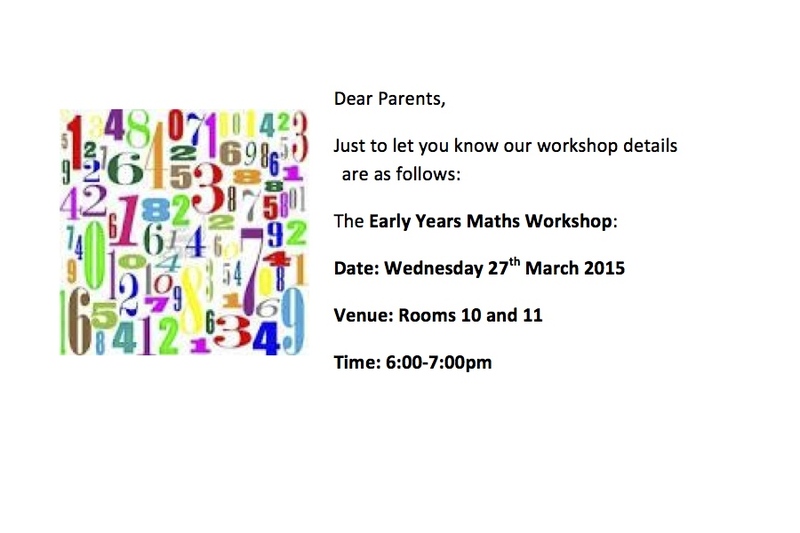 A request for permission for your child to attend has been sent home through the normal EdSmart email to parents. Please see the attached Facebook message from Water Polo Tasmania regarding training tonight. Attached is the initial note to the swimming team for next Thursday's JSSATIS swimming carnival. Also attached is the team list and the program and program cover page for the day. Some minor changes may occur to the program on the day which will be done by the teachers attending with the team. For parents wanting to know exact times of events please refer to the column on the side of the program or the program coverpage which gives exact times. If your son/daughter did not make the team it may be due to there being heats in their events at the Dominic Carnival and unfortunately not having a time in the top group over the heats. Good luck to the team at training next Tuesday and the carnival on Thursday. Please see the attached roster for our 7/8 volleyball team. The first match is scheduled for Monday 18 March. Attached is the information regarding the School Photos for 2019. This year photos are to be ordered online or by cash with your unique ID, which is on your envelope. Family photos are available from the K-6 and 7-10 offices. All photo envelopes are due back on Thursday 28 March. Late orders will not be accepted by the school. The attached letter was sent home with students along with 10 tickets for you to purchase/sell to be in the draw to win one of many Easter prizes. Please see the attached program and estimated timing of events for Wednesday's Southern SATIS swimming carnival. Attached is the Updated 3-6 Swimming Program. Please see the attached updated cricket rosters. Please note there are changes from the original. A reminder that the Year 7 swimming trials will be held tomorrow morning (Tuesday 19 February) at 7am at Glenorchy Pool. This will also be the first training session for the Year 8-10 students who have been selected in the representative team. At the conclusion of the session, a Redline bus will transport students to school where they will be provided with breakfast. Please email nmillikan@dominic.tas.edu.au should you have any queries. Please find attached the JSSATIS 3/4 Boys Cricket information for Term 1. You will find the initial note and regulations along with the 2019 roster in the attachments. Please find attached the note for 5/6 Tennis for this Term. This note will be sent out to all parents via the class baskets on Friday 15 February. Late last year we sent out information with regards to an opportunity this year for the Dominic College community on Thursday 14 February. In 2019 students in Years 1 – 6 will be working through the URStrong program in their EMPOWER lessons. URStrong is an internationally recognised Social & Emotional Wellbeing program, which empowers children with the skills, language and self-confidence to be better friends and develop healthier relationships. As part of this program, URStrong’s creator Dana Kerford, will be visiting our college on Thursday 14 February to train our staff in the program and will also hold a Language of Friendship Workshop for parents and their children at 6.00pm – 7.30pm on this day. Given the time, the College will provide some light snacks. This workshop involves interactive parent and child activities, where parents will learn strategies to help their child put out Friendship Fires®, how to put a voice to their feelings, and the best ways to support their child through unhealthy friendships. The College will subsidise the cost for members of the Dominic Community that wish to attend, the cost of which will be $20 per attendee. Simply use the Coupon Code – DOMINIC to get the special rate. We would like to encourage parents and guardians to come to this workshop to gain an understanding of the language and methods involved in this program. This will enable the messages and methods used to be done so consistently between the home and school environment. We look forward to seeing you this at the workshop. We will be operating with one bus for all stops for Dominic only. Departing Kempton @ 7.30am then Dysart, Swan Street, Midlands Highway ( due to roadworks limited stops - please use the main staging bus area @ Postoffice ), Mangalore ( limited stops due to road works ), Pontville, Main Road Brighton, Jubilee Ave.
Brighton students arrive at Jubilee Ave by 7.45... The bus will arrive soon after this time. Please don’t worry if the bus is not there like normal as it is coming from Kempton and collecting all Dominic students on the way down. This is the ONLY BUS running Monday & Tuesday. So you need to stay on the bus if you live past Brighton. A very happy new year to you all and welcome to the 2019 Academic Year at Dominic College. I hope you all had a wonderful break and had some time to recoup and spend quality time with your children, family and friends during the holidays. Over the holiday break and during Staff Week last week, our teachers and support staff have been working tirelessly to ensure the return for students to 2019 is as smooth as possible. All staff have been involved with planning sessions, professional learning and making various updates to facilities throughout the school. We are all very much looking forward to welcoming students back this Monday. Below you will find some last minute reminders to help you get your child ready for Monday. All students in Kinder timita and Prep-Year 10 will commence the new school year this Monday 4 February. Kinder larila and Kinder tuminana will commence on Wednesday 6 February. A reminder that Duty of Care commences at 8:15am on Year 7-10 and 8:30am for K-6 classes. Full school uniform is to be worn by all students in Prep to Year 10. Classrooms will be open from 8:30am and all students will commence classes at 9:00am. No specialist classes will operate on Monday to give students time to meet and work with their new class teacher for 2019. Please refer to the diary notes provided by class teachers for further arrangements for specific classes. This Monday morning, 4 February, the College is starting a new tradition with the ‘Ringing In’ of our new Year 7 students as a symbol of their commencement of secondary education at Dominic College. Pastoral Teachers will be available from 8.15am – 8.35am at Pastoral Classes to chat with parents/guardians and reassure students on their first day at school. At 8.35am, all Year 7 students will be moving to the Savio Centre for a short welcome and assembly. Year 7s will then process up to the Top Yard via a Guard of Honour set up by our Year 8-10 students and 7-10 staff, with student leaders ringing the bells used at Boys Town in 1952, St John’s in 1959, Holy Name in 1962 and the Angelus Bell as a reminder of our history and past and symbol of the transition to secondary schooling. Students will then commence Morning Pastoral immediately after the procession. This is an exciting new tradition that is starting in 2019 and is a prequel to the ‘Ringing Out’ of Year 10 that will take place at the end of this year. All students in 7-10 are to wear full school uniform on Monday and come prepared for Day 1 classes. Periods 1 to 3 will be organisational activities in Pastoral groups. Formal classes will commence from Period 4 onwards. Students who have practical HPE classes are able to get changed during recess and lunch. The only students who will have HPE classes are: Year 9C HPE, Year 9D HPE, Year 9/10 Adventure Rec A and Athletic Development A. It was wonderful seeing so many parents and children at the K-6 Meet and Greet on Wednesday afternoon. At the end of 2018, we were still finalising a few last minute staffing arrangements, so parents of Year 6A and 6B would have been pleasantly surprised at the Meet and Greet that Mr Benjamin Crick will also be teaching these classes with Mrs Hayley Joyce and Mrs Sue Cunningham. I do apologise that this was not communicated earlier. Ben comes to us with excellent references and wonderful experiences both here in Tasmania and in the United Kingdom. He is an amazing addition to the Year 6 team and is looking forward to working with 6A and 6B this year. I am sure you will all make him feel welcome in true Dominic style. Mrs Jessica Agius will be leaving Dominic College on Thursday 21 February to commence a new position and opportunity for 2019. We are very grateful to Jess for her service to the Dominic community and we wish her all the best in her new role. This week we have been been successful in appointing a new Learning Support Teacher 7-10 for 2019, Ms Samantha Crust. As a result, all students who were timetabled to have Mrs Agius for their classes will instead commence the year with Ms Samantha Crust for their English Classes. Sam has had many years of experience teaching English, Humanities, the Arts and Special Education across many schools and we welcome her to our community for 2019. Mrs Agius will continue working in Learning Support and working on Individual Learning plans until 21 February. We look forward to welcoming all students and families back to Dominic this week and I wish you all a very pleasant and rewarding 2019 and wish your children every success as they undertake an exciting new year of learning with us. On Monday 4 February we are holding a Year 5 Laptop Collection Evening at 6pm in Bosco 5 and Siena 1 in (above our Library) for Year 5 students and parents. As you are aware our 1:1 Laptop Program is an important framework that we use to facilitate and enhance learning for our Year 5 students and beyond. We have learnt that it is essential that both students and parents receive the same information about the care of laptops, access to laptops and the Internet, safe use of the Internet and all the necessary details about effective storage of files. Students and parents are invited to attend the Year 5 student and parent ‘Laptop Collection Evening’ designed to ensure responsible use of laptops by students and enhance parent knowledge and understanding of the program and our expectations of students. During this session all Year 5 students will collect their laptops as well as take part in a ‘getting started’ session which will be held in class groups. Members of our teaching staff and eLearning team will be running these sessions and will be available to answer any questions that you may have. The evening will be conducted in the Year 6 rooms that are now located in the 7-10 area of the school. 5A will be in Bosco 5(across from the old Art Room) and 5B will be in Siena 1 (formerly the Robotics Room). The Year 5 Laptop Collection Evening is expected to conclude around 6:45pm. As the Laptop sessions will be held in the 7-10 classroom areas it is suggested that you park in the top car park near the Chapel or in the parking area above the Savio Centre. We look forward to seeing you there. If you have any questions then please don't hesitate to contact me. In 2013, we launched a detailed pastoral education program called EMPOWER, for our Year 7 to Year 10 students. This program was specifically designed to address identified social and emotional needs within our student body. As part of this program we introduced ‘The Rite Journey’ for our Year 9 students. The Rite Journey is based around the traditional rite of passage of moving from childhood towards adulthood. It has been specifically designed for Year 9 students with the help of numerous specialist educators and child psychologists. This program is gender specific, and taught by staff specially selected and trained. 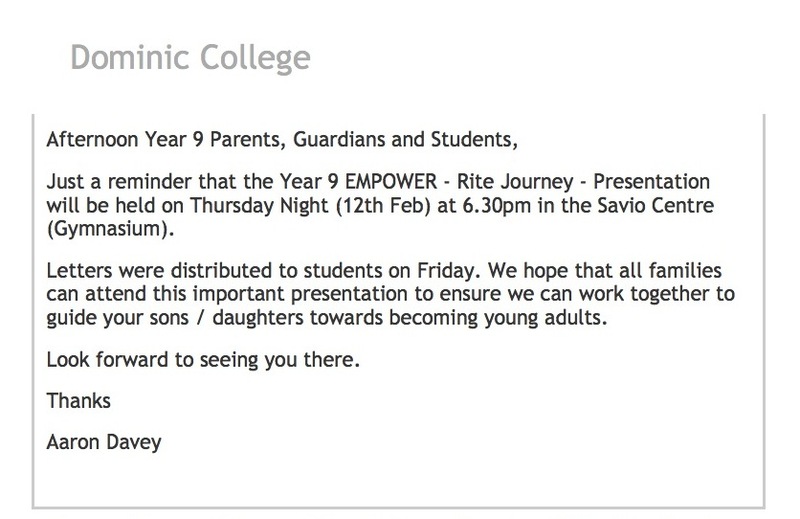 We are launching ‘The Rite Journey’ program for 2019 on Monday 4th February 2019 at 6:00pm in the Savio Centre (Gymnasium). All Year 9 students and one or both of their parents/guardians are invited to attend. The evening is expected to finish at approximately 6.30pm. Parking will be available in the gravel car park which allows easy access to the Savio Centre. This program requires significant cooperation between teachers and parents and will test and challenge our students on a regular basis. The extent of success depends on students and parents being active participants. We look forward to seeing you on the night as we launch this program for 2019. If you have any questions please don't hesitate to contact me. On Monday 4 February we are holding the Year 7 Camp Information Session and Year 7 Laptop Collection Evening. The Year 7 Camp Information Session will provide important information about the upcoming Year 7 Camps being held on the 18-20 & 20-22 March 2019. This session will be held in the Savio Centre and begins at 6:30pm. Parents will be briefed on the structure and activities of the camps and will have an opportunity to ask questions. Immediately following the Year 7 Camp Information Session we will be holding the Year 7 Laptop Collection Evening. As you are aware our 1:1 Laptop Program is an important framework that we use to facilitate and enhance learning for our Year 7 students and beyond. Students and parents are invited to attend the Year 7 student and parent ‘Laptop Collection Evening’ designed to ensure responsible use of laptops by students and enhance parent knowledge and understanding of the program and our expectations of students. During this session all Year 7 students will collect their laptops as well as take part in a ‘getting started’ session which will be held in House groups. You will be directed to these areas from the Savio Centre at the conclusion of the Year 7 Camp Information Session. Members of our teaching staff and eLearning team will be running these sessions and will be available to answer any questions that you may have. The Year 7 Camp Information Session and Laptop Collection Evening are expected to conclude around 7.45pm. As the Laptop sessions will be held in the 7-10 classroom areas it is suggested that you park in the top car park near the Chapel (head straight up past the Business Office) or park in the parking area above the Savio Centre. This will allow easy access to the Savio Centre using the steps and a short walk to cars at the conclusion of the evening. We look forward to seeing you there. If you have any questions then please don't hesitate to contact us. The Principal has written to our parents giving an update on activities and plans for the College. A digital copy is attached. There will be a K-6 Meet and Greet Afternoon on Wednesday 30 January 2019 in your child's 2019 classroom, from 3.30pm – 5.30pm. This event provides you with the opportunity to drop in for a short time to meet with the teacher or teachers in your child’s new classroom. The idea is for your child to find his or her desk and bag locker, drop off stationery and books and generally orient themselves with the new learning space. This time also provides parents with an opportunity to ask any general questions they might have before the school year begins. We hope the first day of the year will then be less stressful for everyone.